Although I was freakishly interested in geography as a kid and knew almost every country, capital, lake and mountain in the world, I had never come across the word Patagonia. The first time I heard the word mentioned, was sometime in the mid 70s. It was through a documentary film shown on my black and white TV about a British expedition across the Argentinian glacier Hielo Sur. What really made a strong impression on me, was the silhouette of Mount Fitzroy, which was shown several times during the film. I was blown away by the shape of the mountain and how it was rising high above all other surrounding mountains in the area. Just the name itself, Mt. Fitzroy, sounded so mysterious in my ears. After the film I tried to find the name in my map book I had kept from school, but it was not there. I went to a local library and found a more detailed map and there it was, right to the east of The Southern Andes. The impression from the film kept its place in my young brain. Years went by as I educated myself to become a mechanical engineer and worked as such for nine boring years. 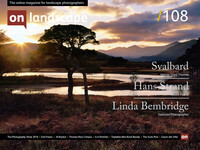 In 1990 I quit my work (thank God) and started a completely new career as a full time landscape photographer. I was eager to learn as much as possible about different landscapes of the world and bought lots of inspiring books, which I digested with burning appetite. In 1993 I bought Art Wolfe´s book ”Light on the Land”. There I found Mt. Fitzroy again after almost 20 years and now in colour. After my crazy debut in mountain hiking in Abisko National Park (described in the previous issue of On Landscape) I had now become a quite experienced hiker through several hiking expeditions through Sarek National Park, in the north of Sweden. After looking at the image by Art Wolfe I simply had to, once and for all, see the mountain myself. I called my hiking partner Anders Ekholm and convinced him to join me travelling to Patagonia.